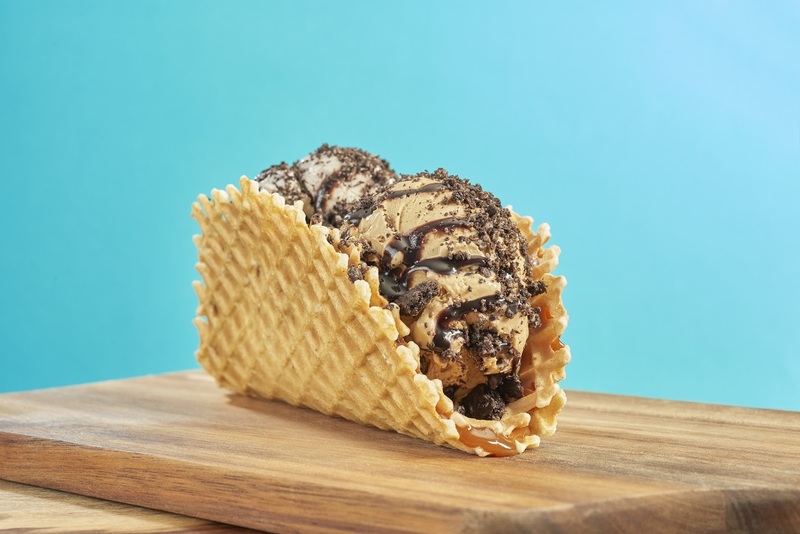 Seeing as they already did an ice cream burrito on 4/20 a couple years ago, this year Ben & Jerry's introduces the new Chill-aco at their scoop shops to satisfy any case of the munchies you might have. The Chill-aco consists of a crunchy waffle cone taco shell nestled in a soft waffle cone wrap with a layer of warm caramel between them, filled with two scoops of ice cream and topped with a fudge drizzle and cookie crumbs. A skeptical reader might point out that it's basically the Brrr-ito fold a different way with some caramel thrown in. You could also look at it as the ice cream dessert version of a Taco Bell Double Decker Taco or a different take on the Choco Taco. You can find the Chill-aco at participating Ben & Jerry's Scoop Shops in the US, Canada, Brazil, Australia, New Zealand, and Singapore for a limited time.